Brooks was an all-purpose star in college, rushing for 3523 yards while averaging 5.7 yards per carry and returning 68 kickoffs for an average of 25.4 yards. Those numbers included a SEC-leading 1208 rushing yards in 1979 and 1314 yards as a senior in ’80. Brooks was an All-SEC selection, along with his teammate RB Joe Cribbs, in 1979 and received second-team All-American honors from the Associated Press and NEA in addition to All-SEC recognition again in ’80. 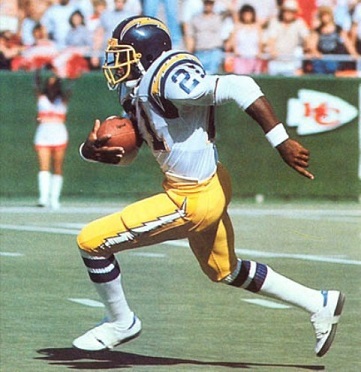 He was chosen by the Chargers in the first round of the 1981 NFL draft (24th overall). Chargers went 10-6 to finish first in the AFC West while leading the NFL in total yards (6744), passing yards (4739), touchdowns (61), and scoring (478 points). Won AFC Divisional playoff over Miami Dolphins (41-38). Lost AFC Championship to Cincinnati Bengals (27-7). Brooks followed up his outstanding rookie season by again leading the NFL in all-purpose yards with 1383 in the strike-shortened 1982 season. He gained another 1475 total yards in ’83 but became disgruntled and was traded to the Cincinnati Bengals for FB Pete Johnson in 1984. Brooks continued in a limited role for a year before being used more extensively at running back in ’85 and rushed for 929 yards and gained another 576 yards on 55 pass receptions. In 1986 he ran for 1087 yards and had 54 catches for 686 yards and was selected to the Pro Bowl. Following a lesser year in ’87 when he suffered an ankle injury, Brooks went to the Pro Bowl after each of the next three seasons. He rushed for a career-high 1239 yards in 1988 as the Bengals won the AFC title. Despite being undersized, Brooks proved to be a tough and dependable runner and productive as a receiver out of the backfield. He finished his career with Cleveland and Tampa Bay in 1992. Overall, Brooks ran for 7962 yards on 1685 carries (4.7 avg. ), caught 383 passes for 3621 yards (9.5 avg. ), returned 52 punts for a 10.9-yard average, 132 kickoffs for a 20.9 avg., and scored a total of 79 touchdowns. Of those totals, 1471 rushing yards and 84 catches for 610 yards came with the Chargers, along with all of the punt returns and the majority of the kickoff returns. He received first-team All-AFC recognition once, second-team honors after three other seasons, and was selected to the Pro Bowl four times.